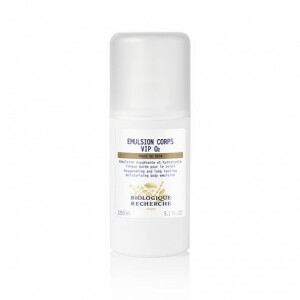 The Emulsion Corps VIP O₂ provides a shield against external aggressors. The skin is constantly exposed to many aggressions from day to day: UV radiations, weather changes, cleaning products, etc. After all of these aggressions, skin needs to be repaired, hydrated and protected. The protective ingredients of this body emulsion strengthen the hydrolipidic film and stimulate the growth of the micro-organisms living on the skin’s surface which guards against harmful bacteria and allows the skin to better defend itself against aggressions. Thanks to its calming properties, the skin is immediately soothed and discomfort is reduced. Finally, its oxygenating ingredients and antioxidants stimulate cellular respiration, fight against free radicals and boost the repair of skin cell DNA, helping to combat premature skin ageing. Fast and easy to apply thanks to its spray bottle, its fluid, non-sticky and light texture penetrates rapidly. Ideal for sensitive, devitalised and very dehydrated Skin Instants®. Moisturising agents: Hyaluronic acid, plant-based polysaccharide. Soothing agents: Complex of amino acids. Oxygenating agent: Biologique Recherche oxygenating complex. Protecting agents: Skin-protective sugar, Cumaru oil. Anti-free radical agent: Tripeptide Antioxidant.